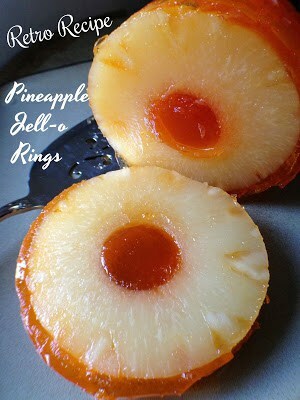 If your looking for a visually interesting and easy dish for summer picnics, potlucks or holiday gatherings, give this retro recipe for Pineapple Jello Rings a try. 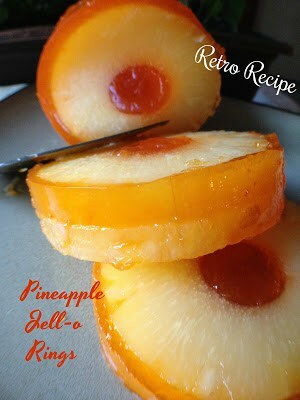 This one recipe from the makers of Jell-o and Dole Pineapple, captures the heart and traditions of the 1950’s. 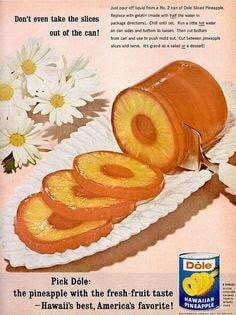 Pineapple was becoming increasingly popular during the 1950’s. This was due largely to the soldiers who served in the Pacific during WWII and also because of the availability of canned pineapple. Fresh pineapple was starting to show up in grocery stores making this exotic fruit even more popular. Many magazines of that time such as Ladies Home Journal and Family Circle were advertising fresh pineapple as the ‘perfect’ centerpiece for your party table. Fresh and canned pineapple was becoming popular to use in appetizers, served with ham as a main dish and in dessert recipes such as pineapple upside down cake. 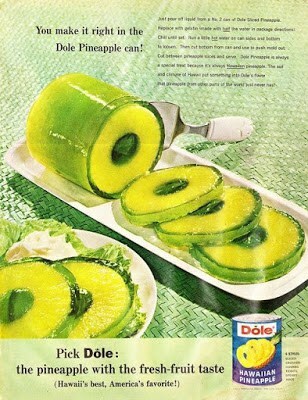 Dole advertisements used lime jell-o but you can use any flavor of jell-o you like. Over the years, Dole advertised the recipe in different flavors and colors, but the lime variation seems to be the favorite. 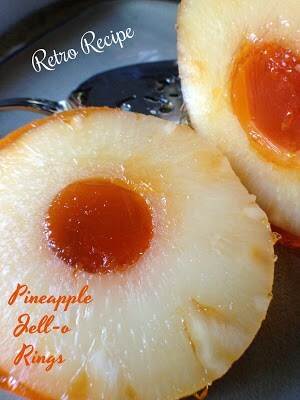 Serving Suggestions: Slice the jell-o into individual rings and top pineapple rings with cottage cheese and serve alongside half a turkey sandwich for a light lunch or serve pineapple jello rings with a dollop of whipped topping and a maraschino cherry for a fast and fun dessert. Kids especially love this fun jell-o dessert. Kids especially love this fun jell-o dessert. For a fast and fun dessert, serve with a dollop of whipped cream, non-dairy whipped topping, sour cream or yogurt. Drain can of pineapple rings reserving the juice. Leave pineapple rings in can, center the pineapple slices in the middle of the can so that when the gelatin is poured in, it surrounds the rings completely. Measure reserved pineapple juice in a 1-cup measuring cup, add water if necessary to make 1-cup liquid. Pour juice/water mixture into a small sauce pan, bring to a boil. Pour boiling juice/water into jell-o. Stir until dissolved. 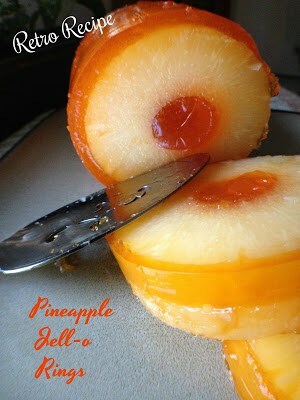 Pour the prepared jell-o into the can of pineapple until it covers the top ring. Cover and refrigerate overnight. Set the can down in warm water for about thirty seconds, invert the can and gently shake out. If you prefer, when you invert the can you can use a can opener to open the bottom of the can and push the Jell-O out.